We’ve done the searching for you. Discover the very best of Hawaii. Kauai, Oahu, Maui and the Big Island. From the author of the best selling Hawaii Revealed travel guidebooks. From private tours to the best beaches, all of our reviews are done anonymously so you can trust what we write. Offline maps, safety alerts and much more...Download Now! You're always armed with the most accurate information including weather updates and safety warnings. No data required to use our custom maps. Perfect for hiking near a volcano or to an abandoned beach. Use our maps to see just how close you are to hidden gems! We'll also mark the spots that are a real treat versus the ones that don't live up to the hype. It's like asking a friend for recommendations! During the research for my first Hawaiian guidebook I spent every penny I had (and quite a few pennies I didn’t have) to personally review all of the restaurants, boat companies, helicopters and scuba companies—pretty much everything I could think of—so I could compare them all honestly and anonymously for what I hoped would be my soon-to-be readers. You'll need these with all the information we've collected for you. Use the app to filter through Hawaii's many adventures, mark your favorites, and discover even more activities nearby on our map. Always know where you are and what's nearby with our interactive maps. Each one has the right amount of detail to point the way. Keep track of the endless amount of resorts, restaurants, and activities you want to see. Use our unique filters such as Romantic Atmosphere or Kid Friendly to plan out your perfect trip. The north lifeguard tower is near the sign saying that there’s no lifeguard on duty. Swimming is not safe during periods of high surf, which will kick the living daylights out of you. Also, note that the wind sometimes kicks up in the afternoon. We’ve noticed that the southernmost (left) part of the beach is usually more protected during strong winds, but the north end is usually less crowded. Up to 18 passengers; minimal shade. Wear waterproof (or none at all) shoes to wade out to the boat at the Hanalei River. Grab a seat on the left (OK, OK, port) side going out for the best views. March–October is their season from the north shore. 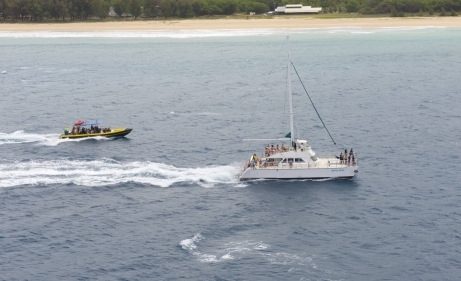 They also launch their older, slightly smaller boat from the west side (Kekaha) year round for a similar snorkel tour. If you’re looking for a treat, consider the shave ice at San Lorenzo’s or Matsumoto's on Kamehameha Highway. (The latter often has unjustifiably long lines, so don’t hesitate to go to San Lorenzo’s.) 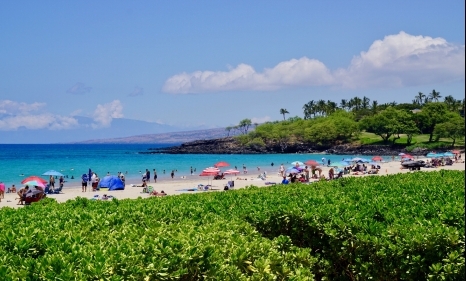 Hale‘iwa Harbor is where you depart for your Swim With Sharks adventure. If you're looking for a new profile pic, there's a hugely popular set of angel wings painted on the exterior of the green Volcom store. After scrambling over some rocks you’ll find a very pretty little stretch of sand backed by trees that you might have all to yourself. A particularly good place to hang out if you're waiting for someone who's plane is late. (Yup, been there, done that.) In front of Kahului Airport off Amala Street. Park at the second (farthest) parking lot. This is an excerpt from the new chapter "VOLCANO UPDATE". Then along came Fissure 8. Like a gopher tunneling underground, the magma worked its way rapidly to the east, outside the park and down the flanks of the mountain. When it got to a quiet residential development called Leilani Estates (elevation 700 feet), scientists sounded the alarm bells. 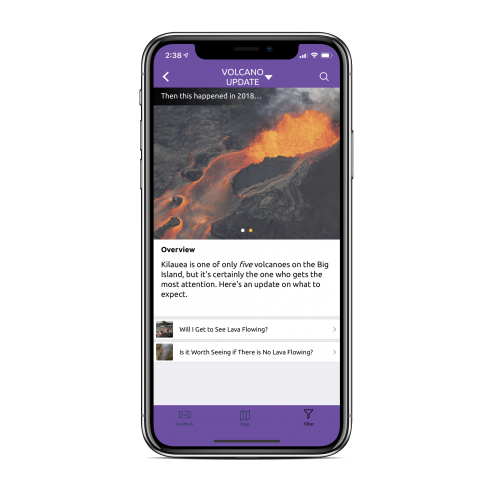 Download the app to find everything on Hawaii. Kauai, Maui, Oahu and the Big Island. Get access to basic information on the islands, from weather to where to stay, for free! Each of the categories has select free sections so you get a sneak peek at what the full package will include. With so many things to do, from watching the sunrise atop an extinct volcano to snorkelling an offshore island, your hardest task will be deciding what to do first. Let us show you the best places to stay and play. Snow-capped mountains, lush tropical forests, crystal clear water and an active volcano. They call it The Big Island for a reason! We’ll show you how to make the best use of your time so you can see everything this island has to offer. Kaua‘i is what you envision when you think of a heavenly tropical paradise. Lush jungles, bountiful waterfalls, gorgeous beaches and countless activities make choosing your adventure a daunting task. "The directions are so thorough. You'll always find the best scenic drives and hole in the wall restaurants that will make your trip unforgettable. The maps lead you straight to where you want to go with exact instructions! My trip wouldn't have been half as good without this app." "The app is so conversational and fun to read. I love the humour in the entries and how straightforward the reviews are! A must-have app when travelling to any of Hawaii's major islands!" "The reviews on the app are all spot on! Our accommodations and the restaurants and beaches we went to were exactly how they were described! I trust the guidebooks and the app completely and can't go to Hawaii without them!" 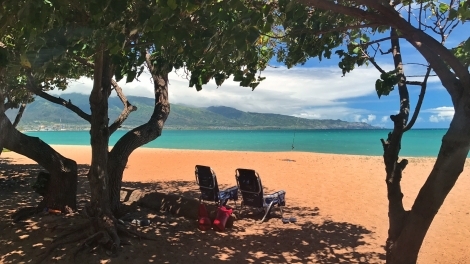 From the author of the famous Hawaii Revealed guidebooks, a.k.a the blue books, which are the No.1 Best Selling Travel Books in the U.S.
Works as the perfect companion to the books or as a stand-alone app. Copyright © 2018 Wizard Publications INC. All rights reserved.